Some see sympathy as a window – a window where they can view the difficulties and burdens of those less fortunate yet not get involved. However, sympathy is not a window instead; it is a doorway – a doorway through which deeper relationships are created, where needs are met. 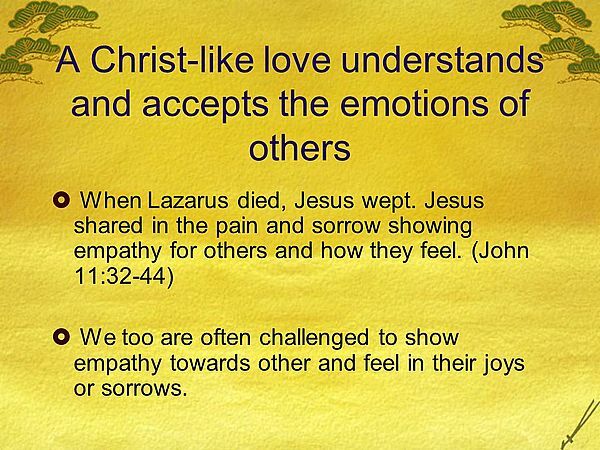 Sympathy for Jesus turned to empathy, which then turned to compassion, which then turned into action. There are those this day that will cross your path that will need you to become a part of their suffering. You will probably not be able to give life to the dead, but you can help resurrect dying hope and disappearing dreams. Perhaps you are the one who stands in need of someone to come to your assistance. If so might I suggest you re-read the account of Jesus’ sympathy for Mary and ask the Holy Spirit to take you inside the story – you can be rest assured, it will! Jesus ministers the same yesterday, today, and forever! Amen so true, bless God always! Excellent read/post! It really speaker to me!